MESSIAH'S BRANCH Ministries and International Radio: End Time Radio By Messiah's Branch - PROPHECY HOUR: WHEN GOVERNMENT BECOMES GOD: WHAT HISTORY TEACHES US! End Time Radio By Messiah's Branch - PROPHECY HOUR: WHEN GOVERNMENT BECOMES GOD: WHAT HISTORY TEACHES US! PROHPECY HOUR: WHEN GOVERNMENT BECOMES GOD: WHAT HISTORY TEACHES US! 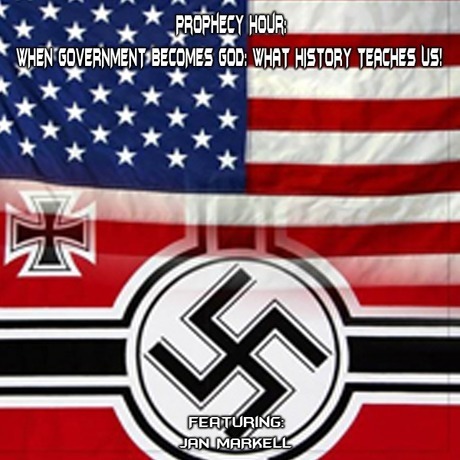 PROPHECY HOUR: WHEN GOVERNMENT BECOMES GOD: WHAT HISTORY TEACHES US! She is on almost 700 radio stations. a partial list of comparisons from Germany, 1938, to America, 2014: are Uncanny! •The demise of Capitalism was fine and the rise of Socialism was accepted. •Few blinked when prayer was taken out of school in 1935. •Daycare raised the children of Germany in the 1930s and 1940s. •Christmas and Easter were taken out of the German public schools. •Socialized medicine ruined the German healthcare system. The elderly and handicapped were marginalized. •Abortion became the new normal and was even expected. •Private education was gone by 1938. •Government spending skyrocketed and no one said a word. Taxation soared to 80%. •First there was gun registration but that was followed by gun confiscation by the Nazis. •Free speech gradually faded. The newspapers and other media proclaimed the pro-government side of a story. •The green agenda was adopted as it was steeped in paganism and Hitler loved paganism. •Government spying went off the charts. •Children sang songs of praise to Hitler. •Germans were spellbound by the great oratory skills of Hitler. He couldn't possibly be lying to them. •The church in Germany did not want to make waves; it did not want to tackle controversy. Pulpits would never address serious issues or politics. •The church in Germany was steered into mysticism such as today's American pulpits that are okay with Christian Yoga-type deceptions. Hitler knew this would weaken the church and make it ineffective. Most, but not all churches in Germany, were riddled with compromise. •Many pastors in Germany wanted to be popular and find favor with the government. They did not want to offend anyone.